Oversight AI combos well with cards that have high strength and a high installation cost. Ideally the subroutines can do some significant damage in the mean time. Archer: Main thing here is getting a good piece of ice out without having to forfeit an agenda and only 1 . Curtain Wall: is pretty expensive at 14, however in combo with Oversight AI that's only 1 and possibly strength 10 depending on server position! Other mentions: Hadrian's Wall, Orion, Wotan and many more ice that runs on the expensive side. Beefy ice more likely to slow the runner down and act as a tax to runner since he/she will know exactly what it is. Can only rez ice during corp turn rather than during runners run. Does not combo well with big Bioroid ice that can simply be broken. 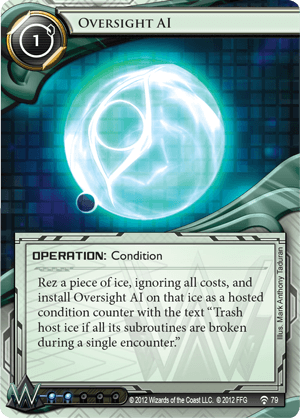 I really do like Oversight AI, I generally tend towards cheaper ice but Oversight AI allows me to play with some very powerful ice that I would normally just look over. Obviously it changes the nature of that ice so that it simply taxes the runner. Still that taxing can be important to open up a scoring window. It is splash-able for two influence points in other faction decks, but probably not more than one per deck. Playing as Weyland however Oversight AI should definitely be considered.